Securely access and manage your Packet servers. Doorman is a VPN (virtual private network) service that helps to secure traffic between you and your servers for management purposes. This is not a VPN solution between servers for web traffic. In order to use the Doorman VPN service, you will need to have Two Factor Authentication (2FA) enabled via the Packet app. 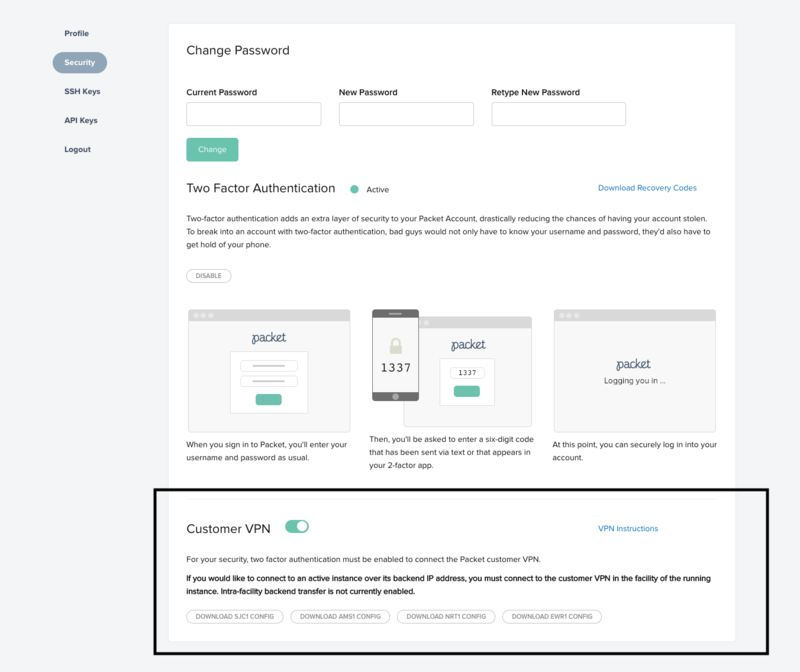 To enable 2FA, simply log in to the Packet Portal, then go to 'Settings'=> 'Security' where you will find the option to enable 2FA under Set Up Using an App. You can use your favorite 2FA app, as long as is supports Time-based One-time Password Algorithm (TOTP) which is an open standard. Example: Google Authenticator, Authy, Duo Security, should all work fine. Once you have 2FA enabled, a new option will be visible, Packet Customer VPN. After you turn it on, you will see the option to download the OpenVPN configuration files for each of Packet’s facilities. If the portal password is "packet-rocks-2017" and the 2-factor token you generate is "123456", when logging into the VPN, your password would be “123456packet-rocks-2017”. Once the connection is successful, you will be able to ping your server’s Private IPs, as well as connect via SSH. ️Please Note: Doorman service is available in core sites. Custom sites are coming soon.